For open calyceal diverticulectomy, success is the rule (2). Laparoscopic calyceal diver-ticulectomy replicates the techniques and principles of the open surgical approach. As such, symptom-free, stone-free, and "diverticulum-free" rates in reported series are 100%, 100%, and 93%, respectively, albeit with very short follow-up (Table 4) (18-24). In one patient, a residual diverticulum was noted on follow-up intravenous pyel-ograms, measuring only 10% of the original lesion (20). 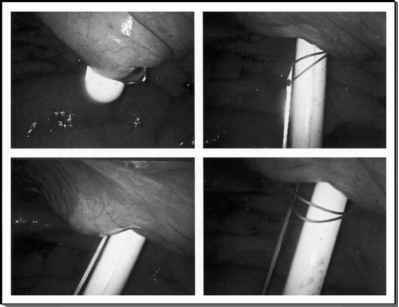 The authors noted that the diverticular cavity was fulgurated but not filled with fat tissue in this case; all subsequent cases involved obliterating the diverticulum with fat tissue, and no recurrences were noted. Overall morbidity is low with laparoscopic calyceal diverticulectomy. Operative time is about three hours, and hospital stay is generally two to three days. Complications were minor, including subcutaneous emphysema, self-limited fluid leak, and a three-unit blood transfusion, occurring in one patient each (Table 4). aResidual diverticulum measuring 10% of original size, cavity not filled. Abbreviations: N/A, not available; IVR intravenous pyelogram; CT, computed tomography.